People who have hailed an Uber car at least once know that they must rate their driver on a scale of 1-5 stars at the end of the ride, or before they are allowed to order a subsequent ride. Drivers, conversely, must rate the passenger before being allowed to accept the next ride request. This system, built into the Uber passenger and driver apps, ensures that ratings are collected on each and every Uber ride. After more than 300 trips as an Uber driver, I have come to realize that most passengers have little or no idea how those ratings work and what they mean in terms of the quality of service that riders receive. Ideally, passengers who follow the basic code of Uber conduct (enter the correct pick-up location in the app, be ready to go when the driver arrives, don’t eat or drink in the car, be polite, don’t leave junk behind, and don’t throw up in the car) receive a rating of 5. If any of those items are not followed, chances are great the driver will knock the rating down by a point or more. When a driver receives a pick-up request, he has 15 seconds to accept it before the ride is offered to another driver. In those 15 seconds, drivers have to quickly assess whether they want to accept the ride or not (drivers are required to accept 80% of the rides they are offered.) The only information drivers receive in that short period of time is the passenger’s location. Drivers are NOT told where the rider wants to go, much to most peoples’ surprise, until the passenger is in the car and the “Start Trip” button is pressed. A driver may reject a request if the pick-up location is far away (I sometimes decline requests to pick up in Sonoma, 40 minutes away, because I may only get a 5 minute ride out of it). If a driver accepts the ride request in those 15 seconds, then he is told the passenger’s name, and can see their rating. If the driver looks at the phone and sees that “Joe” has a low rating, the driver will sometimes immediately cancel the ride through the app and not continue to the pick-up location. No reason is given to the passenger; Joe just receives a message that the driver has canceled the ride, and Joe must start over. Joe has no idea that he has been rejected due to his low rating. Now, what about driver ratings? What almost no passengers seem to know is that drivers must maintain an average rating of 4.6 stars or they get booted out of the system and are required to take a remediation class from Uber. Yes, you read that right—4.6. Seems like a very high bar, doesn’t it? Now of course, a driver’s rating is based on at least a hundred rides, so a few low scores are not going to adversely affect any particular driver. But I have talked to many passengers who have no idea that this threshold exists. 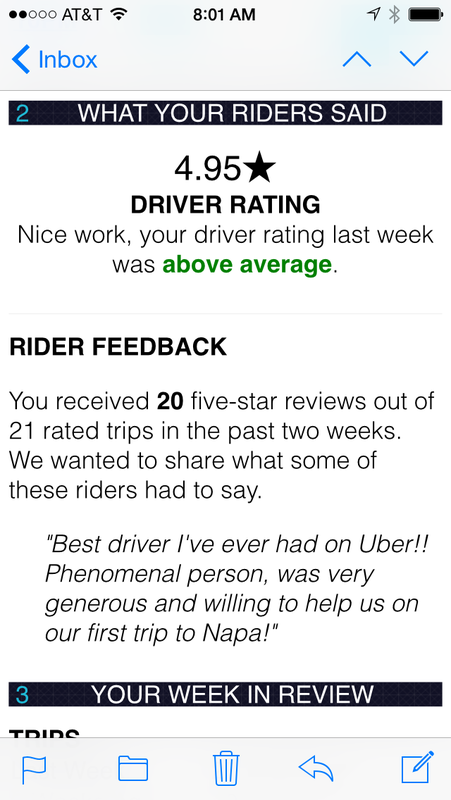 And many of these passengers rate drivers like my old Silicon Valley employers did: namely, most drivers get a 3 rating if they show up and do their job as expected. A few get 4’s if they do something really remarkable. And maybe 1% get 5’s if they go way above and beyond. In Uber’s way of thinking, if a driver does everything just as expected, the rider should award him with a 5 rating, not a 3. This can complicate life for a driver if too many passengers use the corporate way of grading. Having learned the hard way early on, many drivers, including myself, do everything we can to exceed our passengers’ Uber expectations. In my case, I jump out and open doors for my riders both at pick-up and drop-off (if safe), and ask the passengers if they have a particular type of music they would like to hear from my Sirius radio. I often carry bottled water in the warmer months and will offer it to passengers on a longer ride. I keep my car clean, dress well, and offer pleasant conversation and Napa Valley insights if appropriate. In the long run, the rating system helps assure passengers they will get a decent driver and car. If your driver is late, surly, has a dirty car, plays the music too loud, gets lost or takes a longer route than necessary, then by all means rate him low. If enough passengers do that, a rider won’t be around too long. But just remember, the driver will rate you also. So do your best to be a passenger deserving of a high score. If your Uber ride goes off just as expected, even if it’s nothing flashy, don’t hesitate to give the driver 5 stars. It’s the same reason I give 5 stars to almost all my passengers, even if they aren’t the most personable people I have ever met. This entry was posted in Napa, Uber. Bookmark the permalink. Great article,So what do you think, should i become an UBER driver in St. Helena? The north end of the valley is fairly underserved, so I would encourage you to do so.